Today was a slow day at work, so I was doing the usual surfing the Facebook newsfeed. I came across a post from my friends over at Branchline Brewing Company about a special rare cask of Oso Knotty Oyster Stout which was dry hopped with Willamette Hops. This caught my attention cause since Branchline opened, I have said that Oso Knotty is my favorite beer by them, so having a different variation of this beer was something I could not pass up. After a few Facebook comments on their status, I knew I wasn’t going to be there alone, so that was a good thing! It turned out a couple of more people I knew were there. I ended up hanging out with San Antonio Cerveceros member, Jesse Reyes, and a couple of guys behind Busted Sandal Brewing Company, Rob and Joe. Good beers with good company. What an awesome afternoon I had! OK, now to the beer I even went there for. Oso Knotty Oyster Stout Special Cask (Dry Hopped with Willamette Hops). The beer poured a nice black color with a creamy white head which stuck around the entire time, leaving a good lacing on the glass. The aroma was a bit of a character. It had the elements of the base beer, the oyster stout which has a salty, briny, oyster shell like smell combined with chocolate notes. Well this one also has the sweet smell of hops, right up front nose to nose with the salty aroma, so you get them both up front. Leaves a great tingle in the nostrils! Willamette gives off a floral like scent, which to me worked real well with the briny oyster shell aroma. It really reminded me of an ocean scene, and also sitting in front of a large plate of raw oysters ready for consumption! Mmmmmm! Taste wise, it went right along side with the aroma. Ocean like qualities, leaves a saltiness aftertaste combined with the spice of the hops. What I really liked about this beer is that the retained the creamy head, giving it a cream ale like feel up front. Very unique. I know the guys over at Branchline like to do a little experimenting and release a unique style beer. I believe I have also had the chance to have this same Oso Knotty Oyster Stout brewed with Chipotle Peppers and Vanilla Bean. From what I remember, it was also an awesome beer. Since we stayed and talked a bit longer, it was my chance to taste some Freetail Brewing beers. Still on tap since St Patrick’s Day was their unique Spirulina Wit. What makes this beer unique? Well how about that they brew this beer with natural blue-green algae known as spirulina. So patrons who visited Freetail on St Patrick’s day were ordering this beer instead of artificially green colored beers. I know I got this beer last year, but could not remember the taste of it, so I was anxious to get another whirl at this bad boy. 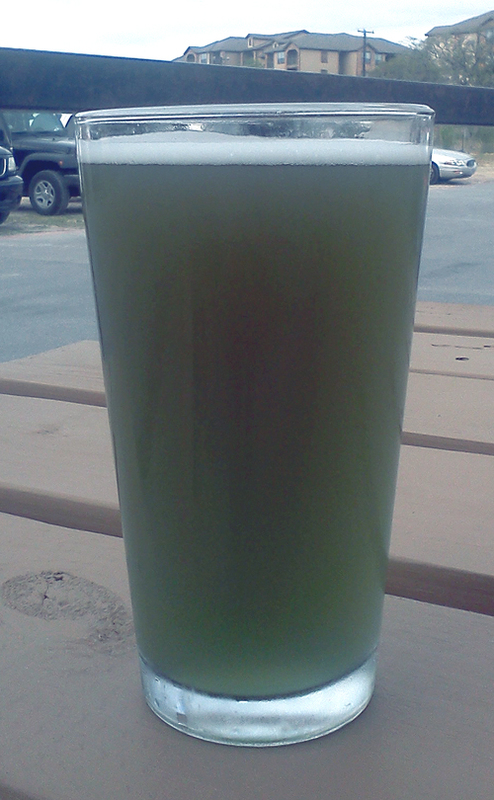 Of course the beer poured green, but it was cloudy, a bit murky, dare I say, swampy with a thin white head which vanished quite quickly. As most people have said, and I will concur, this is definitely one of the most unique beers I have ever seen. The aroma of this beer is also something out of the ordinary. It has an almost candy like smell, very sweet. To me, it smells exactly what blue-green algae would smell like. This aroma reminds me of when you pass by the health nut isle at your local grocery store. The taste is similar to the smell. It tastes sweet and candy like, and maybe it’s a mental thing, even though I was trying my hardest to focus on the taste without any blockage, but it was like drinking that medicine that you hated before actually tasting it. As you remember, we all hate that nasty medicine, and avoid it at all costs, and finally after taking it, you realize it wasn’t that bad, and from then on it was easy to swallow every time you needed to take it. Now I hope my description isn’t scaring you away from this beer, as I mean all this in a very positive way, cause I really enjoyed my science class flask of Spirulina Wit! With that being said, it isn’t for everybody, but I do encourage you to open your mind up a bit, and go give it a try! I did have two more beers while there which were Ugly Ollie Stout by Freetail Brewing Company, and another one of my favorite beers at the moment, Brewluminati by Independence Brewing Company. I will hopefully be able to get those again on another visit so I can review those, but for now I am going to leave this review at the two beers I already talked about. Overall my experience here at one of San Antonio’s brewpubs, was a good one. The staff at Freetail was awesome and talkative, and fast responding. They were catering to the fans of NCAA basketball, as they had their number of TVs on different sports channels showing different games. I did not get any food on this visit, but they have an excellent menu which includes brick oven style pizza, sandwiches, good appetizers, and more. I am a frequent visitor to this establishment, so I would recommend this place to everybody. Go for food, stay for a beer! Go for beer, stay for the food! Go for sports, stay for food and beer! Either way you will be satisfied there at Freetail Brewing Company. Take your non craft beer drinking friends and get them to taste what they have been missing all these years drinking the “other stuff”….FLAVOR! Until next road trip!